Toss the cubed potatoes with the melted butter until coated, and then spread them evenly on a baking sheet. Place them into the oven. Roast for 20-30 minutes, or until potatoes are browned and crisp. In a small bowl, whisk together the vinegar, mustard, garlic, salt, and pepper, then slowly whisk in the basil oil. 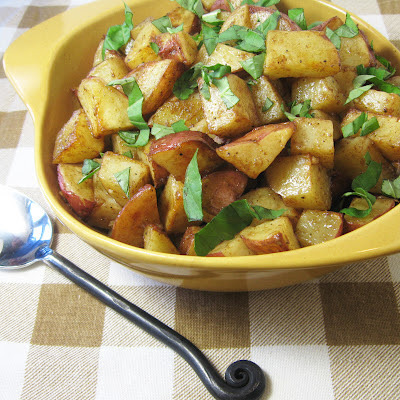 Pour about ½ of the dressing onto the hot potatoes and toss to coat, allowing the vinaigrette to soak into the flesh of the potatoes. Taste, adding more dressing as desired. Season with additional salt and pepper, to taste. Just before serving, add chopped fresh basil and stir gently to incorporate. This potato salad is best when served warm or at room temperature.